Today we built a simple circuit on paper and used an LED to illuminate our success! Here’s a paper circuit from the Island of Nunivak Alaska. A big thank you to all of the partners who helped us with supplies and inspired us to make our notebooks light up! We have been studying atomic theory and how different particles behave. I think the electron is our favorite. 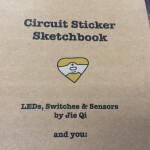 I decided to create a resource page for my students who are exploring paper circuitry. There have been a lot of great ideas shared on the web. I want to create a spot where students can find information about the project we are doing in class. A spot where they can look at the video tutorials on their own. I know a lot of students like to have extra supplements. I found that organizing this site also helped me organize my own ideas and resources for the project. 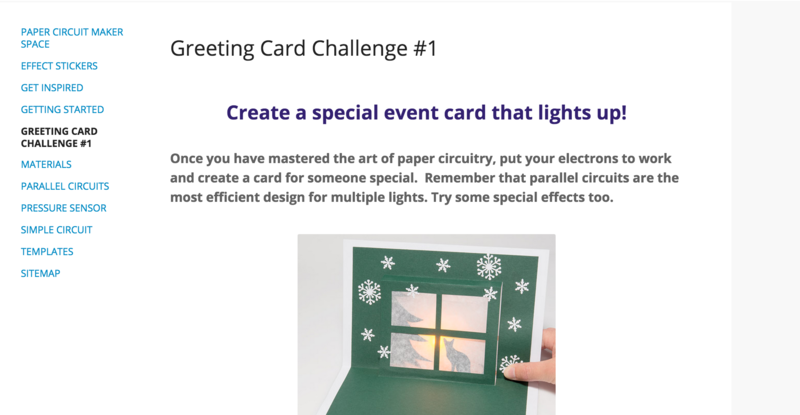 This activity is an exploration designed to give students a chance to build a paper circuit product. 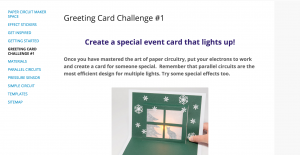 In order to build this card, students will need to learn basic concepts of electricity and how energy flows through a circuit. I will use this with my 9-12 grade physical science class prior to the formal lesson on electricity. Next Generation Science Standard – Develop and use a model of two objects interacting through electric or magnetic fields to illustrate the forces between objects and the changes in energy of the objects due to the interaction. HS-PS3-5Science and Engineering Practice: Develop a complex model that allows for manipulation and testing of a proposed process or system. Start a KWL chart with students about electricity. Then challenge the students to complete the PHET Models on static electricity. Have students add to their KWL chart and be prepared to share one item the learned doing the simulations and one question they have about electricity that they want to learn more about. Explain that electrical circuits provide a defined pathway for electrons to flow and power electrical devices. Hand each student a multimeter and have them discover which items are conductive and insulating. As you share the results of using the multimeter to measure electrical flow, add the words insulating and conducting to your chart. Also introduce the word circuit. Compare a parallel and series circuit. Build a series circuit and explain the advantages and disadvantages of each design for lighting the LEDs. Use the multimeter to demonstrate how current flows differently in a parallel and series circuit. Students will build a short illustrated story card or a greeting card that incorporates a switch and LED lights. Advanced students can add special effects with micro controllers. Students completed projects and a completed KWL chart will be used to grade this project. A pre and post test on electrical circuits will be used to measure science knowledge acquisition. Today I have been challenged to think about making the idea of “making” sustainable in my classroom. How do I bring back what I have learned about paper circuitry and apply it in my classroom? The Maker Movement is a technological and creative learning revolution (Martinez and Stager). This strategy draws on children’s natural inclination to learn through doing. The modern Maker Movement capitalizes on digital technologies that make inventing, tinkering and designing accessible to students. 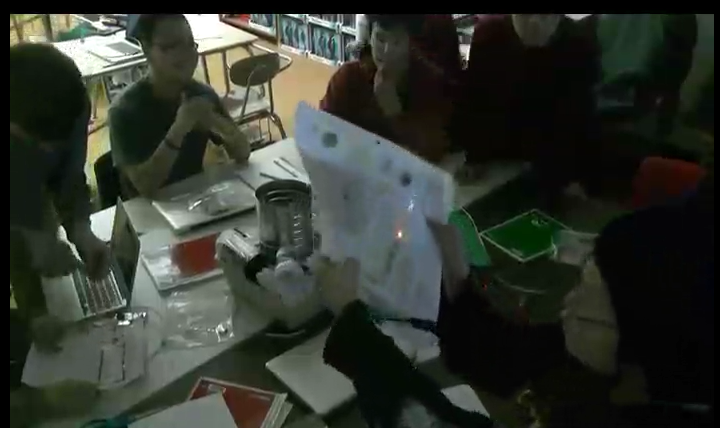 Paper circuitry is a great example of a media that allows students to create while learning high tech skills. In researching this challenge, I came across an article called “Crafting the Make Mindset” on the Edutopia Blog . Lisa Yokana writes about the thinking processes that create a culture for invention in a classroom. She proposes that teachers can teach creativity skills through with models of the design process. Engineers use these models to facilitate the development of products as a team. This process helps to nurture a classroom culture where students think about their work in terms of a process rather than a set of instructions to follow. I think this is an important distinction between facilitating an activity that reflects the ideals of the Maker Movement versus a prescriptive assignment. It is also a natural tie into the inquiry science approach. 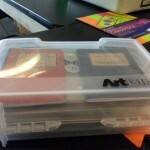 I was introduced to the idea of “hacking your notebook” in a webinar that AKTeach hosted this spring. I had never seen circuit stickers or heard of paper circuitry before. My students create science notebooks in my classes so this was a great moment of discovery for me. 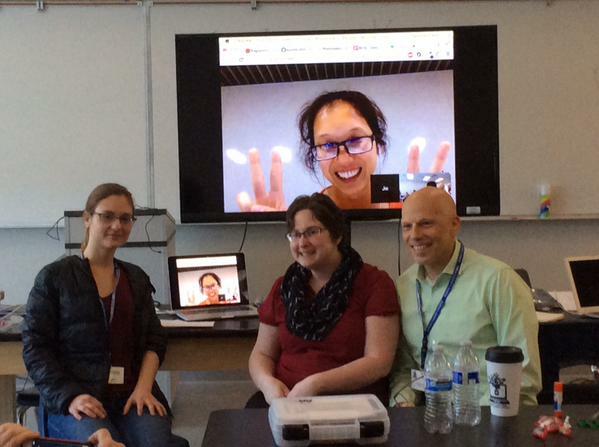 I was very fortunate to be invited to the two day workshop during the AKTeach Distance Learning Conference. 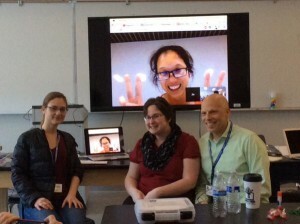 Jie Qi, David Cole, Natalie Freed, and Nicole Fuerst. Our workshop facilitators. Here is a lesson I plan to do with my students this fall. A much richer path to learner how electricity works. During the two day workshop, David Cole from Nexmap and Natalie Freed of Telescrapbook shared their work with using electronic circuits, sensors, and micro controllers to create expressive art in paper notebooks. Much of their work has been in cooperation with Jie Qi of Chibotronics. This is an amazing intersection of art, creativity, science and invention. This was one of the best classes I have attended in a long time. 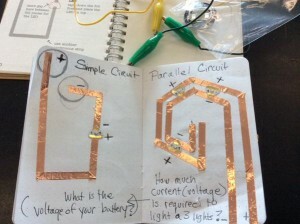 The tools and strategies they shared have inspired me to integrate paper circuits into my students’ science notebooks. In a virtual class, it is often harder for the students to organize. I find that using a paper notebook can serve many goals from organizing, archiving notes, and allowing for creative expression and reflection. 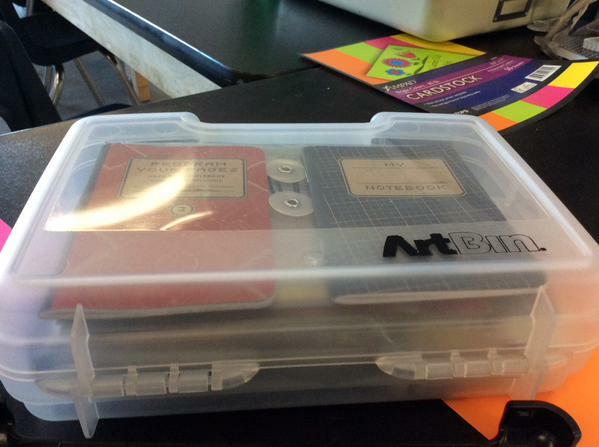 I began to use science notebook strategies with my students eight years ago. Each year my skills in utilizing these notebooks increases. Attending this class has opened up whole new possibilities for evolving the use of a paper notebook with my students at a distance. I love the high tech/low tech approach. It is simplistic in a way that is conducive to distance learning classes. The resources that David, Natalie and Jie shared are so well engineered it will make it easy for me to apply this in my distance learning science courses. The integration of paper circuitry will enhance my physical science unit on electricity. This was the first time that I had built a parallel circuit and then a series circuit where the conceptual differences really clicked. I have taught this lesson many times before. But with the application of an art project in my notebook, it finally makes sense. I am a very visual learner and this process really helped me understand the foundations of electric circuits at a deeper level. I will be a better teacher of this concept in the future. I want my students to experience this kind of insight into the basics of electrical circuits through creative play. I love the idea of play, invention and discovery before deconstructing a science concept. This seems like a more natural way of learning. Taking this workshop has also inspired me to explore the maker movement as a conduit to teaching students about science. I am committed to Inquiry Science, but have felt that inquiry science lessons are awkward to teach. The concept of tinkering and building as a conduit to inquiry intrigues me. I think my students will have a greater natural desire to make and create through problem solving as opposed to more formal controlled scientific experiments. These are important, but I think students are missing the opportunity to play and tinker as a scaffold to structured inquiry. 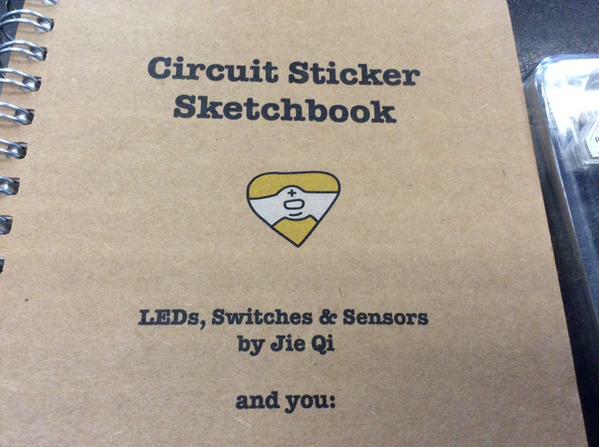 This is a book developed by Jie Qi to help learners create their first paper notebooks. Easy to follow and very hands-on. 2. Learn to use copper tape.